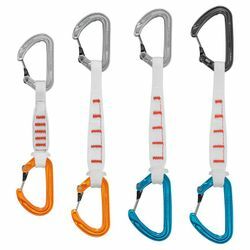 Petzl Ange Finesse Ultra-light Quickdraw. Designed for alpine climbing and situations where every gram counts, the ANGE FINESSE quickdraw is ultra-light, compact and durable. Featuring Petzl's MonoFil Keylock technology and an H-shaped cross-section, ANGE carabiners are very lightweight and offer an optimal strength/weight ratio. Strong and ergonomic, the FINESSE sling provides a good grip. The STRING quickdraw sling protector maintains the proper orientation of the carabiner making it easier to clip. Available in two lengths and two carabiner sizes.